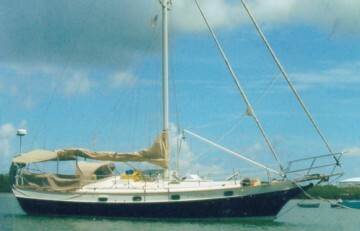 This 1986 Krogen 38 Cutter is the ideal liveaboard sailing yacht for the cruising sailor. Heavily constructed by the people who build the Kadey-Krogen trawlers, she draws just 3'2" with centerboards up and as much as to 6'8" with the boards down,or any amount in between, allowing her to access any anchorage with ease and to have remarkable sailing stability, in the heaviest weather, with all sails flying. Her interior space seems much larger than that of a 38 foot yacht with ample headroom throughout (The owner is 6'5" tall and is very comfortable on board). Her large queen-size berth, comfortable stand-up shower, large front cabin V-berth for guests, wonderful salon, with a folding teak dining/cocktail table,large three burner propane stove/oven and double sink, and plentiful storage,including louvered teak cupboard doors for ventilation, throughout guarantees your comfort at sea or at anchor. Alcala's all-teak interior is in showroom condition. She has a very large cockpit, with sizeable cockpit table, for easy entertaining and comfort during overnight sails. Alcala has been impeccably maintained, has new upholstery both below and in the cockpit, along with a new dodger (including Lexan windows) and bimini. Alcala is fitted out with custom-made stainless steel davits that are exceptionally sturdy and carry our 12' Zodiac dinghy, and outboard motor, while under way. We have converted her mainsail cover to a stackpack style sailbag to make dropping the fully battened mainsail and closing the bag, a simple and fast operation as well as allowing for reefing the main without having to tie it down. Alcala is presently berthed in Ft Lauderdale, Florida. There is nothing to be done before you can shove off and cruise the islands or circumnavigate the globe. Alcala is offered for sale for US $98,000. Please contact us for more information or the owner direct at jeff@krogen38sail.com &#8203;or at (954) 892-2382. Seven berths in 3 cabins. Alcala?s hull is of fiberglass sandwich construction with closed cell PVC foam core, which does not deteriorate or absorb water. The composite structure serves both as a buoyancy material and shock, sound and temperature insulator. It rides quietly, increases impact strength and eliminates condensation build-up inside the hull.